$29 if rented with an inflatable! 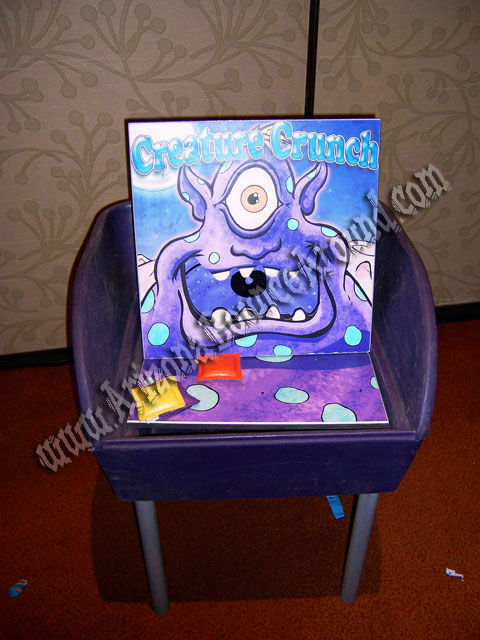 Our creature crunch carnival game is a cool carnival game for carnivals and birthday partiess for children. This game comes with 3 bean bags and the object is to get all the bean bags in his mouth to win. You can play it however you like but we supply everything needed for play. This game comes complete with its own legs or they can be removed for table top use or put on the ground. Everyone will love this carnival game so rent one for your next carnival themed party or event. We have a full selection of carnival games and carnival rides to fit any theme or budget. We also have really nice carnival game booths to make your party look amazing.